Caption slip reads: "Photographer: Lou Mack. Date: 1958-09-24. Reporter: Bill Coart. Assignment: Train vs Auto -- 18235 Valley Blvd. Pat Martinez, CHP dep. and Arthur B. Mason, Chief Conductor -- S.P. Golden State Limited V.C. -- Henry Ragsdale -- 33. 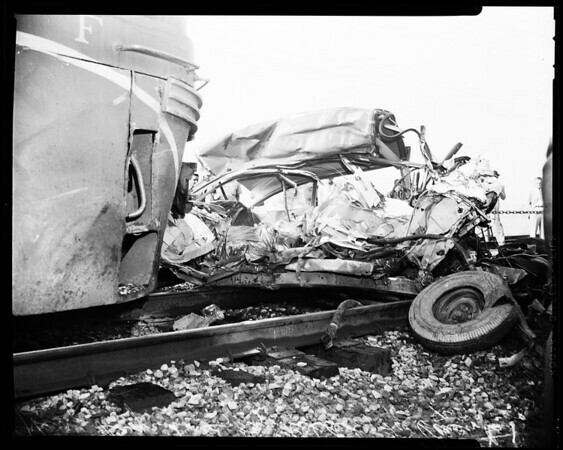 General views of car under train -- removal of body. At Valley Blvd & Nogales St. in La Puente".